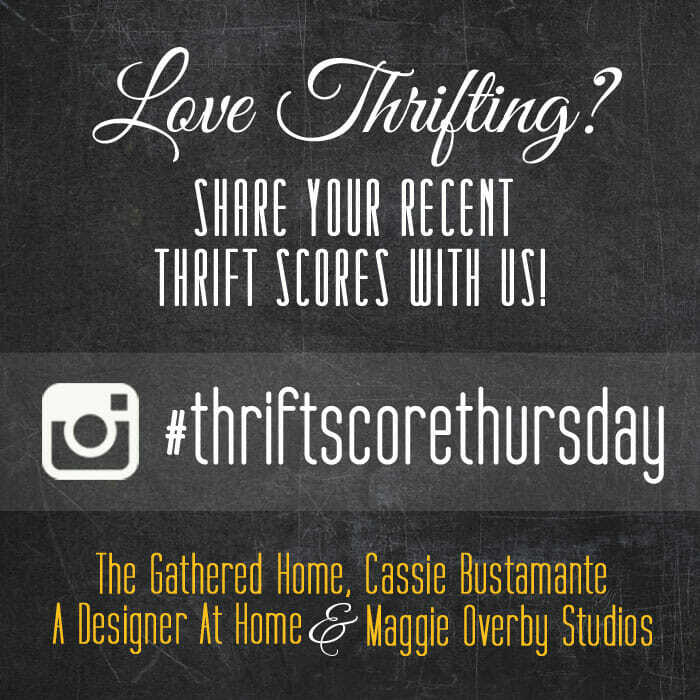 It’s Thrift Score Thursday and I am pumped because I went to the most epic yard sale last weekend and found loads of things for me…. 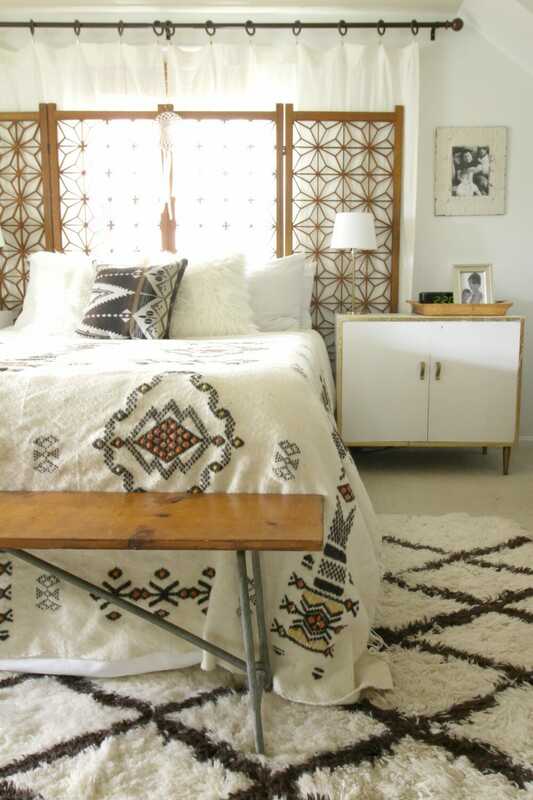 like new to me boho bedding! My find first…. So I have a pile of finds from this one yard sale that should get me through the next month of Thrift Score Thursday, that’s just how amazing it was. I thought I would share my favorite find first. I found this vintage wool handmade blanket from India… I know it was from India because the sale was an elderly woman with her two daughters, and she enjoyed telling me some stories about her pieces and where they came from. She told me $15 for this piece of beauty and I knew I wanted to add it to my fall bedroom! The colors aren’t my typical colors but it’s perfect this season and works beautifully with my moroccan rug. The hand stitched details are so beautiful. 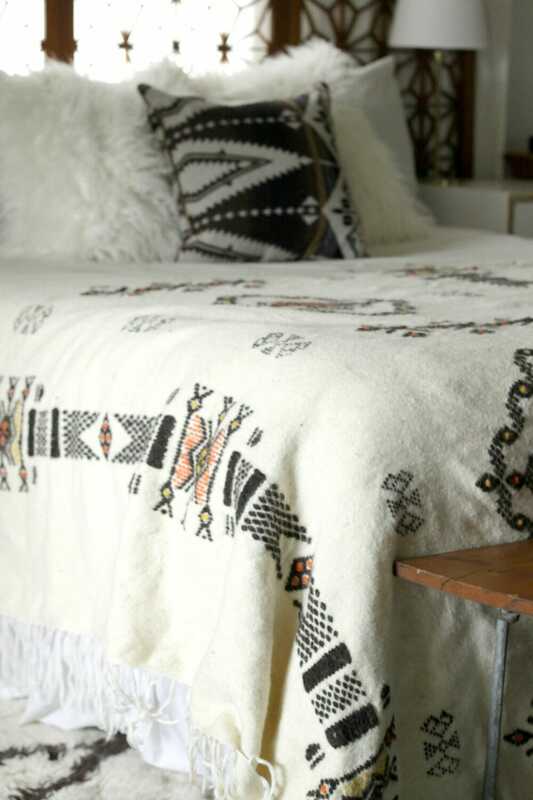 I’ve wanted a funkier blanket for this bed and this one is perfect! The fact that it’s wool will help carry it through this season. I searched etsy and found some very similar blankets below for you, and this shop was having a flash sale at the moment. Now let me show you my features this week. There were so many great finds that it was touch to narrow it down. 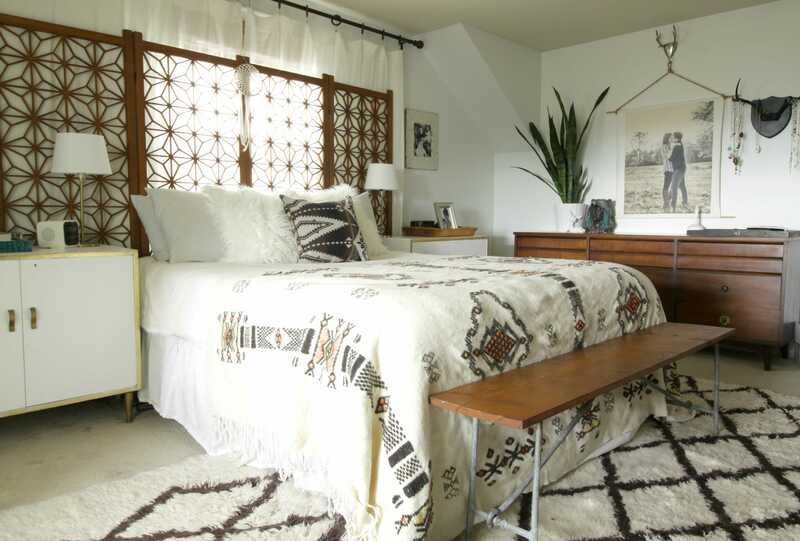 Amber found this tasseled vintage bedspread and added it to one of her sofas from a set to hide the set-ness of it. 😉 I love this look! 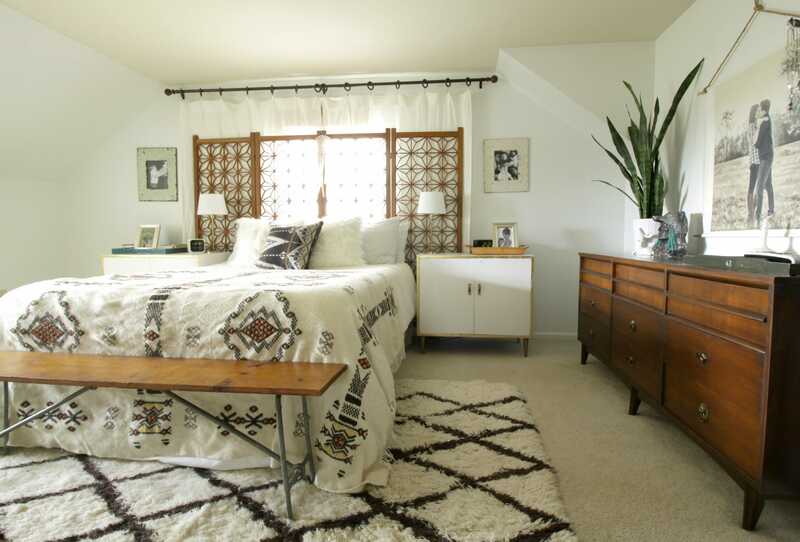 I spy some great greenery and macrame going on, too. 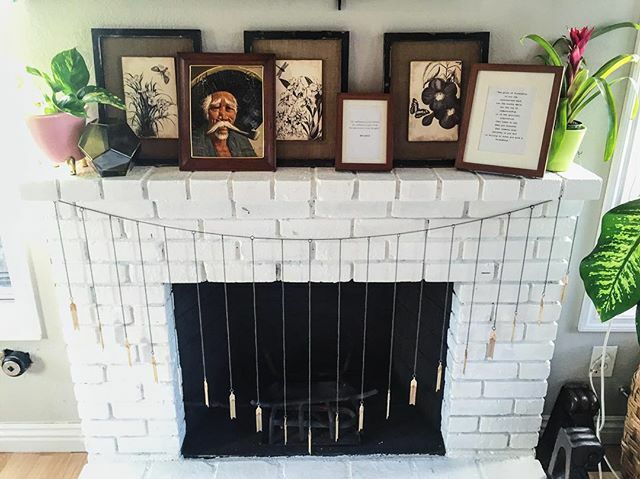 And I am loving this thrifted art mix that Patina Pennys showed off on her gorgeous mantle. Her garland reminds me of my cohost, Corinna’s! Now head on over to see what my cohosts are sharing this week! Oh that blanket is amazing! I can’t wait to see what else you scored. Those kind of yard sales are my Nirvana. that blanket is so fabulous! amazing find! Love your new to you blanket! Can’t wait to see your other finds from the epic garage sale! Super cute indeed!!!!! Love it! Cassie!!!!!!! What a killer blanket! Blown away it was only $15. Jackpot!!! I am madly in love with your new blanket!!! It’s so, so fabulous! Dying! thank you, brynne! me too! That blanket is stunning! I love the texture it brings to the space and the hand-stitched details are so pretty. Great score! thank you so much, shauna! I was stoked! While I shivered in the brisk fall air last night, that blanket was calling my name. You can mail it to me if you insist! Gorgeous! Totally my kind of style. So funky and fabulous! What a great find! i was STOKED! i went knowing i didn’t need anything for the shop anymore but found loads for myself. isn’t that the way it goes? I don’t remember if I told you I’m deeply in love with the furry pillows. 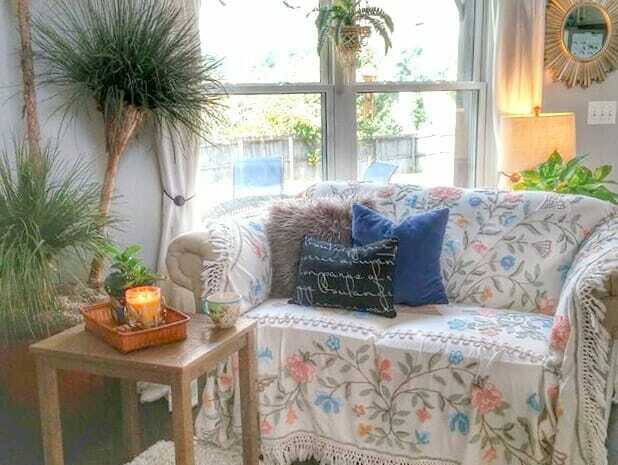 This decoration theme is really helpful for me as well as others who also love this pillow model. Thanks a lot!